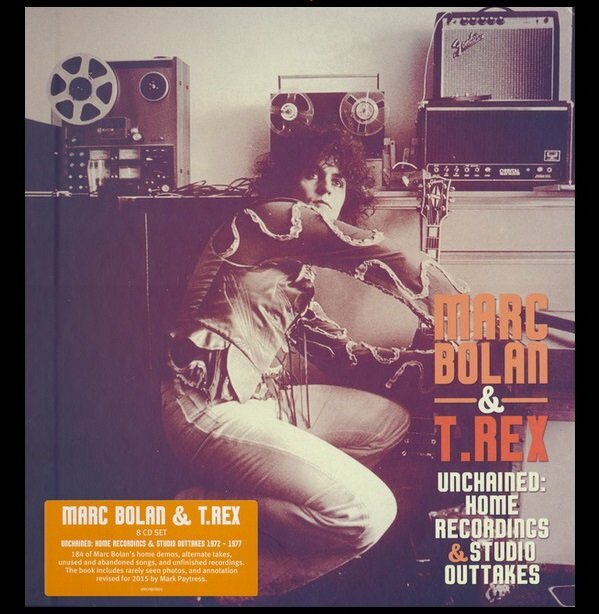 This is yet another Edsel re-issue (the third, in fact) of the 8 CDs featuring Marc Bolan’s home demos, alternate takes, unused and abandoned songs, as well as unfinished recordings. This time we are presented with a limited edition 12” x 12” bound book set. Sounds great – but is it worth the hype? To put it upfront, the whole affair might appear much more to the hard-core Bolan collector rather than the true connoisseur of T.Rex music. Granted, the 8 CDs rack up a total of almost 190 tracks, though the word ‘tracks’ should be used with care here. As the title Home Recordings and Studio Outtakes suggests, a fair amount of what’s on offer aren’t musical tracks at all, well, at least not refined ones. Instead, fans get to hear Marc goofing about in the studio and are treated to a crash course in what goes on during ‘musical experiments’, while in Marc’s home studio we can hear the boppin’ elf mumbling words, shuffling about, trying out different chords, riffs and so forth – accompanied by strange blips and plops coming from the microphone and what have you - often only for a few seconds before stopping abruptly. Is anyone really interested in listening to such ‘add-ons’ which obviously were never meant to reach the ear of the wider public in the first place? To be fair, some rough-edged (and obviously unpolished) sparklers are to be found amongst the debris, and it’s those sparklers which provide an insight into the creative process of Bolan the musical genius. There are instantly recognisable T.Rex sounds and also strong bluesy influences galore on CDs 1 & 2, like ‘Over The Flats’, ‘Guitar Blues’, ‘Unicorn Horn’, ‘Sailors of the Highway’, ‘Meadows of the Sea’, ‘Fast Blues – Easy Action’, ‘Bolan’s Blues’, ‘Work With Me Baby’, and ‘Slider Blues’ with the awesome lyric “I’m the son of a preacher and I was born on Beltane”. Yep, that’s our Marc alright! Amongst the highlights on CDs 3 & 4 are the wildly rockin’ and riff-heavy ‘You Move Like A Dog’ and the wonderfully Gospel-influenced ‘Sky Church Music’. Well, there’s even an ole Wurlitzer sound on ‘Look Around’, while the epic ‘Jam’ smacks of Hendrix influences left, right and centre… and possibly smells of purple haze, too. It’s the second half of the set that spits out the glam-infused T.Rex sound that’s oh so instantly recognisable, and it’s great to listen to many of the included tracks, albeit in more raw versions, shall we say. ‘Bolan’s Zip Gun’ truly rocks and is fabulously demented, ‘Love For Me’ features some great piano, ’11.15 Jam’ bursts with its snarly riffs, and extracts from ‘Video Drama’ can best be called bonkers – but in a nice way. Shame the same can’t be said for ‘Voice Poem’… ah well. Once again, ‘I’m A Voodoo Man’, ‘Decadent Priestess’, ‘Midnight Creeps Across Your Window’ or ‘Messing With The Mystic’ speak volumes as to the lyrical genius of Bolan – an undisputed genius who had a knack for creating outlandish poetry before turning them into musical works of art and fantasy. The set comes with completely new artwork, including rarely seen photos. Mark Paytress, MOJO writer and author of the acknowledged definitive Bolan biography ‘Bolan: The Rise and Fall of a 20th Century Superstar’, has revised his original annotation for this new 2015 package.